Now that Day 5’s leaderboard (covering the activity for Thursday) is out, I want to focus our thoughts on the incredible effect of a physical platform appearance on your digital leadership. If we look at Arianna Huffington’s score profile over the past 5 days of the Cannes Pride leaderboard we can really see this effect in action. Arianna spoke on Tuesday the 18th. Before she spoke she was still in the pride but at a low rank – below 1200 on the Monday. After her talk she tweeted just 13 times and was catapulted to number 1 – due to the high number of retweets (53) and @mentions (111). Then since her talk her impact on the Twittosphere has waned (there have been many fewer retweets and @mentions of her twitter post about Cannes) and her rank has dropped to 190th. For me this shows how digital and physical go hand in hand – big names in digital can become big names live and vice versa. Crucially though, you can’t maintain a top rank in the Cannes Pride by being influential on just one day (though she may still win the overall leaderboard for the week) – great social media marketing is about maintaining a consistent presence as well as relevancy with your audience. It’s not too late to play in the Cannes Pride leaderboard – simply tweet #canneslions and you’ll join it. 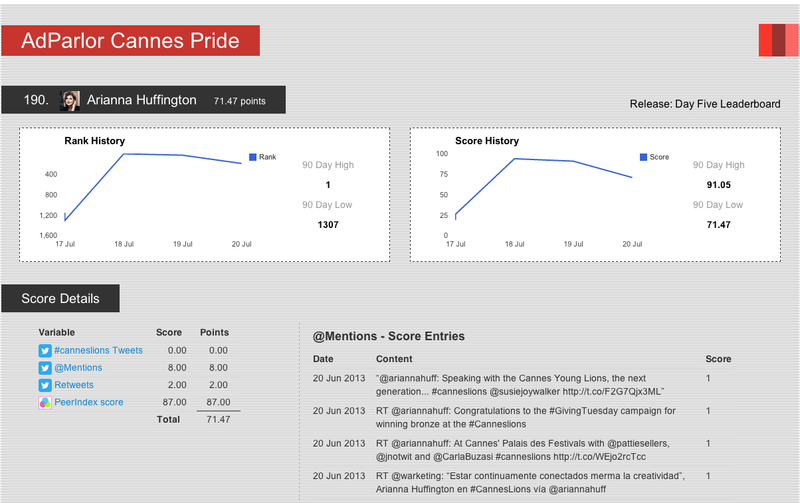 Head over to the leaderboard at www.cannespride.com and sign in with your twitter account to see your rank and stats. Social media is a fad, we can safely ignore it. I’d be interested to know!